Having your home appraised is an easy and crucial step in the selling process. Having your home accurately priced will help it perform better in the market and will help ensure the best price possible. 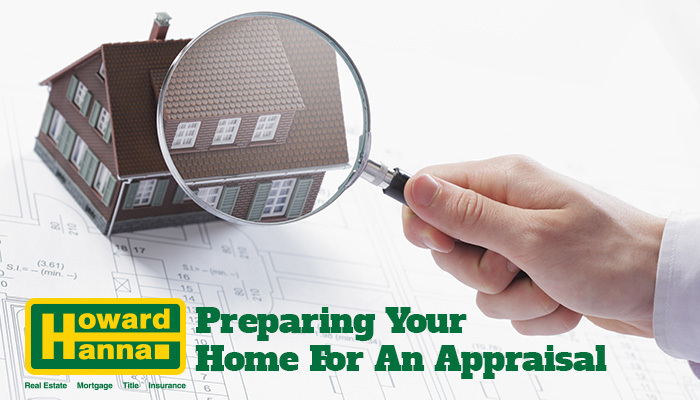 Preparing for a home appraisal can benefit you when the appraiser inspects your home. Get rid of old items or things collecting dust. Sell or donate gently used items and toss worn out items. Clean carpets, mop the floors, wash the windows, and scrub the bathrooms. On the exterior of your home, pull weeds and dead plants, power-wash driveways, plant new flowers, replace old mulch, and trim trees. The fresher and cleaner your home appears inside and out, the more value it will bring in! Fix them up! Make sure everything is working properly. Appraisers will measure home value in $500 increments. If they notice issues in your home, this can result in thousands of dollars lost. Check the home structure, appliances, and roof. Call in professionals if the tasks are too big or complicated to handle yourself. Putting time and effort into fixing the little things will ultimately create a huge impact. This can also show that you have cared for your property and kept up with it. If something is old, outdated, or beyond repair, consider replacing it. This can be anything outdated, such as old wallpaper, appliances, light fixtures, paint, countertops, and cabinetry. This may seem costly at first but will bring in more money for your home, especially if it is an older home. Any repairs or replacements you make or have made should be recorded and kept. Give these to your appraiser so they can give the most accurate appraisal possible. If you’re on the fence about certain items, consider getting a home warranty. By purchasing a warranty during your home’s listing period, you can help cover common out-of-pocket expenses that sellers often face due to mechanical failures. If any covered system components or appliances break down after the sale of your home, the buyer can turn to HSA, thereby preventing any post-sale disputes. Check out HSA Home Warranty for coverage in PA, OH, VA, and NC. For NY, VA, and NC, check out 2-10 Home Buyers Warranty. What is it about your neighborhood or area that makes it special to you? Take note of great things about your area. Inform your appraiser of any new amenities in your area, such as schools, businesses, stores, restaurants, or even increased highway access. The area in which your home is located can affect an appraisal. Sometimes, you home value can increase without you even needing to do anything! Also, take a look at the selling price of other homes like yours. See what features you have that other homes didn’t and alert your appraiser. This is also a good way to see what features those homes have and possibly add those to your home, giving it a higher value. Remember, an appraisal doesn’t have to be stressful. Being prepared and having everything ready will provide an easy appraisal experience for both you and your appraiser, all while getting the best price for your home!